$34 Promotional Gift Card available on this product! 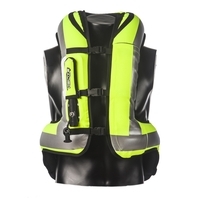 This Hi Viz version of the Turtle vest is mechanically the same product as the standard vest, but with the Hi Viz color and HUGE reflective stripes all over it. Lets face it… the vest looks a little daffy, so why not go all out and double down on the safety by being seen!